It’s 90s Nostalgic Easter Time! 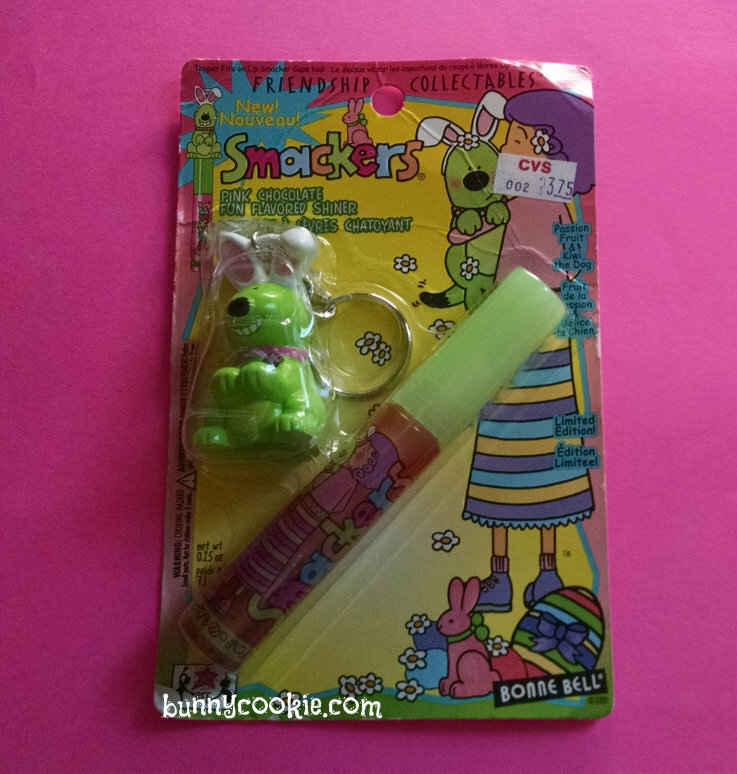 Here are some fun 90’s Easter-related goodies I dug up that I thought I would share! 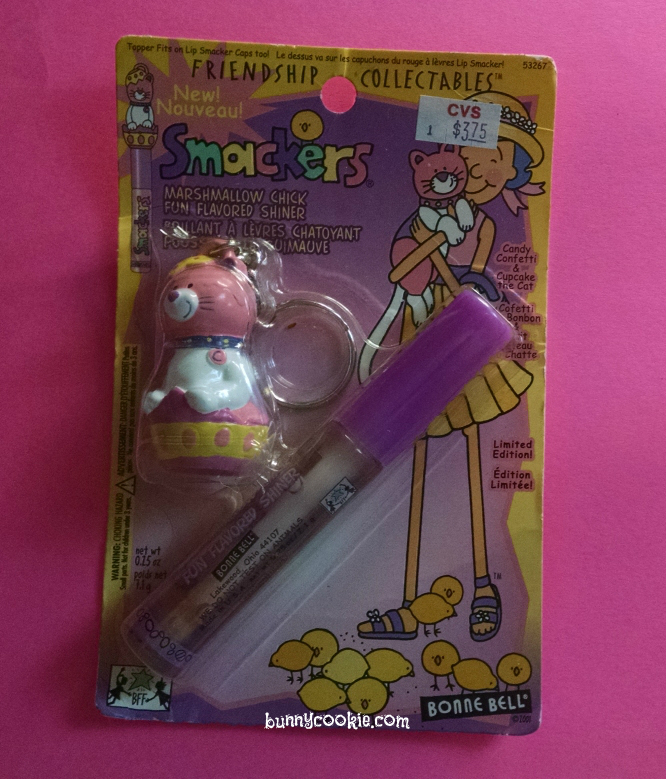 These Friendship Collectibles are some of my favorite Smacker products <3 Check out Passion Fruit and her lovable doggy, Kiwi on this Pink Chocolate flavored lip gloss. The back says “Kiwi is a silly dog who loves to make Passion Fruit laugh. Passion Fruit can’t help but giggle whenever she sees Kiwi wearing bunny ears.” Aww. Here’s a yummy Wild Berry Jellybean lip gloss, featuring Starfruit and her pet monkey, Muffin. Bubble Gum and her pet bunny Sugar are too adorable with their Bubblegum Egg gloss. These sets are so adorable! Bunny Cookie, which Easter set is your favorite? Happy Belated Anniversary of your blog, Bunny Cookie! I can’t believe it’s been four years since your first post. Those are adorable! I miss the old art work. They were more eye catching. Yesterday I saw some one selling a clear train bank with 6 vintage Lip Smackers for $19.00. *Checked this morning and it was bought. 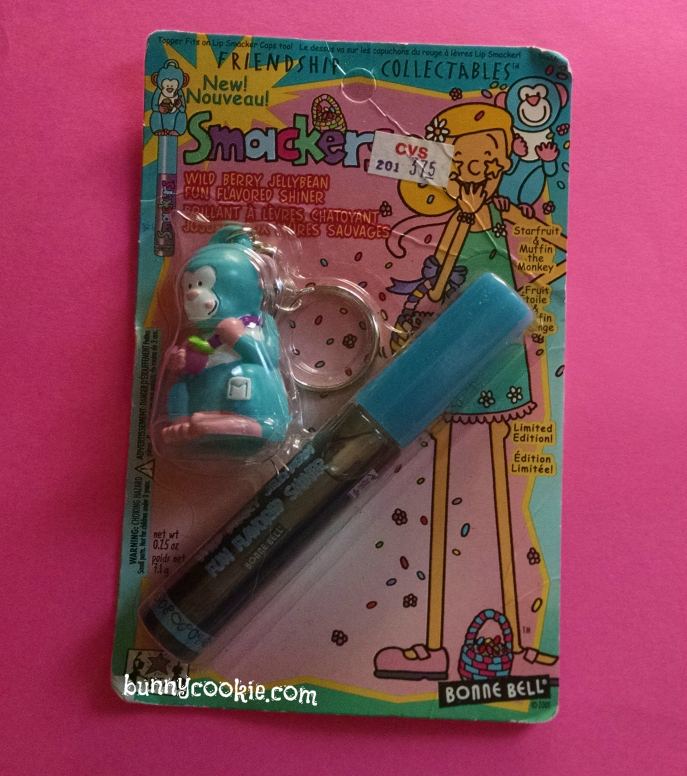 I was tempted, but the last time I bought a vintage Lip Smacker it was really hard to apply- I kept the container for safety pins in my sewing kit and bought a new Buttered Popcorn. I had the marshmallow chick gloss that came with the kitty topper. I loved it! The kitty was so cute and the flavor was great. Honeybee I will be sending out ur trade on Monday. I couldnt get to the post office today. And thanks again, was a great help on my quest for a backup set of novelties. No problem 😀 I was happy to help. I don’t know if anyone has tried the Horchata yet- but mine was AMAZING! (sadly it was the only one at Rite Aid. They have Lip Smacker products buy one get one 50% off. ) It was more cinnamon than vanilla and delicious. Hoping that when I go to get my Diet Coke later at another Rite Aid I can find another. See, I wanted to LOVE Horchata more than I do. I literally stalked store shelves and the website after I heard it was coming out! I don’t think it smells authentic at all and the cinnamon used smells cheaper, imo. What batch number is on the bottom of yours? Mine is M51 and I even purchased a couple hoping my first tube was a fluke. The minute they decide to invest in their cinnamon flavors like they use to, and make a more authentic smelling ones, I will buy by it/them by the 100’s!!! Mark my words! That should read “I love the horchata flavor!” Didn’t check my spelling before autocorrect. Mine says M51 also. That’s odd, it tastes really good. Did everyone see MAC Cosmetics announcement today about their Trolls collection their doing for summer? 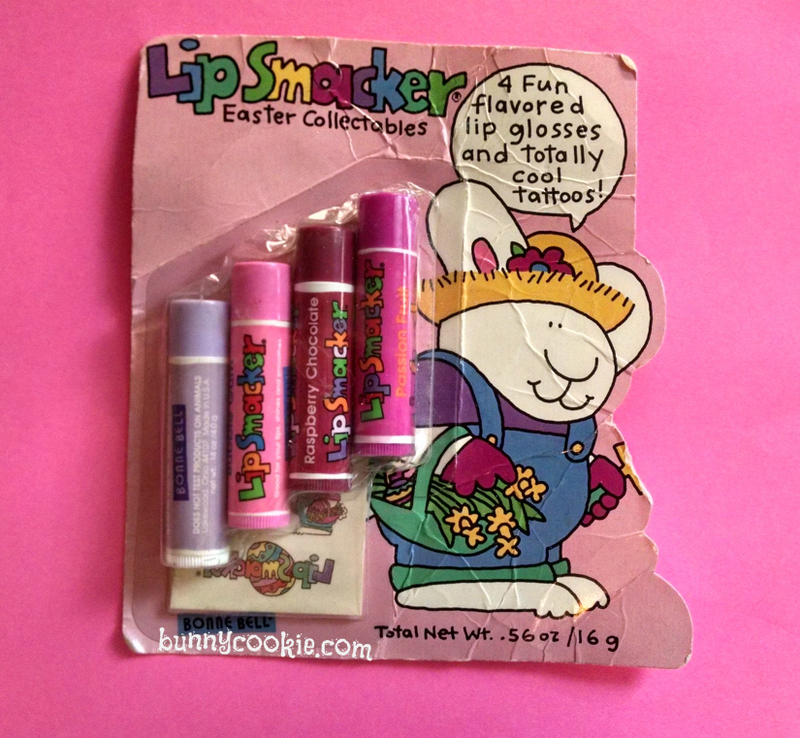 Love to say, that LIP SMACKER DID IT FIRST! 😉 Speaking of…can’t believe that was a year ago already. Also can’t believe they didn’t do more with them. They were really cute! Would of loved jewels on the belly but other than that, loved them! I did see that! And I liked the Lip Smacker packaging much better too. I just got horchata. I love it! I finally got some Smoothie Chillerz Lip Smackers (the new singles, not the party pack), and they’re in such cute packaging! I haven’t opened them yet. I found the new Chillers at Rite Aid down the street from me today!! I havent opened em either. Altho the Bananas one looks yummy. I havent used “Horchata” yet but it smells good. 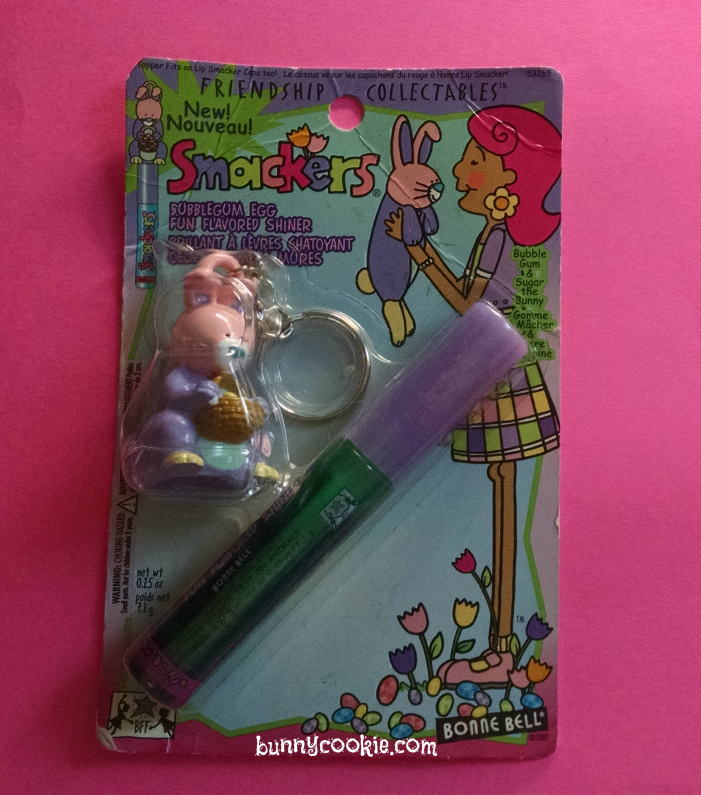 Found another amazing sell on ebay of Lip Smackers. They were from the late 70s / early 80s. I biggy Crush, 5 regular sized tubes (Mint Chocolate, Peppermint, Tootsie Roll, Jelly Bean and Good & Plenty)… Sold for $255. That was a fun auction to watch. Came across this offer on ebay this morning for any one looking for the novelty flavors. These are from either 2 or maybe 3 years ago where Lip Smackers released sets of 4 flavors (you bought 3 and got one free I think was the pricing breakdown) This offer is or 5 sets of 4 Lip Smackers for $13.95 plus shipping. Skittles Lip Smackers in Banana Berry, Strawberry Starfruit, Mango Tangelo, and Green Apple. Lip Smackers in Toasted S’mores, Kettle Corn, Frozen Lemonade, and Sour Apple. 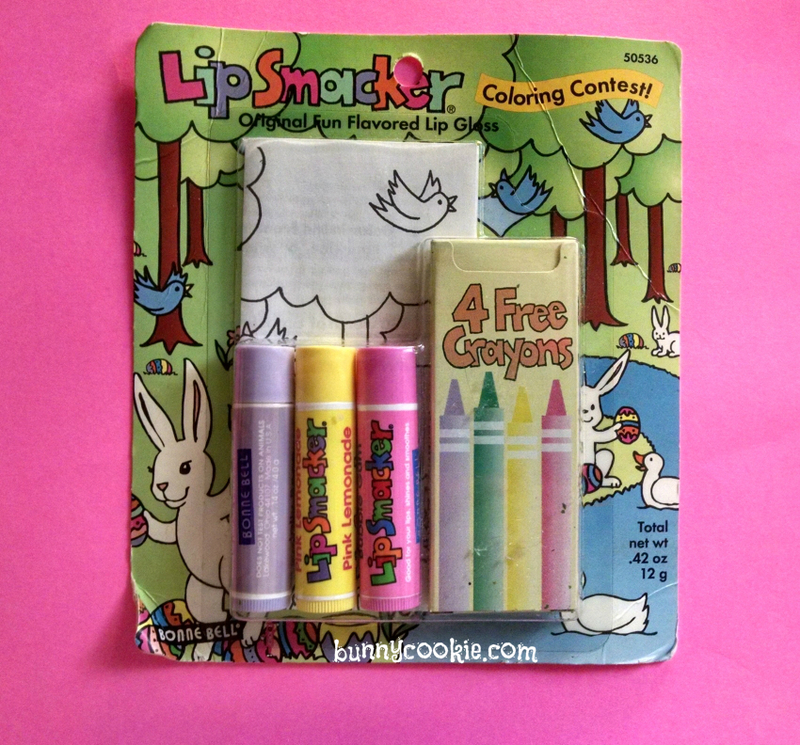 Lip Smackers: Ice Cream Sandwich, Ice Cream Cake, Strawberry Milkshake, and Cream Pop. Lip Smackers in Cherry Cream Soda, Vanilla Malt Shake, and Salted Pretzel. Lip Smackers in Funnel Cake, Candy Confetti, Snow Cone, and Pumpkin Latte. ***Please note- I’m not the seller nor do I know the seller. I’m a Lip Smackers-a-holic and just wanted to help people find good deals. Has anyone tried the “Root Beer” in the sport collection? Is it like Barqs, A&W or Root Beer Float? Or different? I have not tried it! I wish I would’ve picked some flavors up from that collection when i saw them. Yea I been wondering if it was any different..